Anyone that knows me knows that I love nothing more than creating beautiful spaces, I’d been a fan of the show since it’s first series so at the end of the last series as the credits rolled and there was a call for entrants for the next series I thought why the hell not, you only live once, so encouraged by my other half I emailed the production company. A couple of months later I received the application forms, and within a couple of weeks there was a crew at my house, filming me to further support the application process, at this stage I was one of 36 potential contestants (the talent) as you are referred to and shorlty after was informed I had been selected along with 17 others to go through to the next stage. Long story short I was given a mock brief and a week to produce a moodboard. 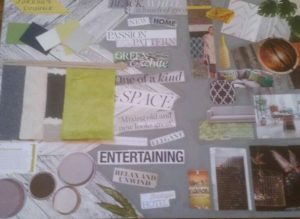 This moodboard and my film footage were to be presented to the BBC. Aware that the day had arrived I waited with baited breath and couldn’t have been happier to receive a call from Frankie, who I’d been dealing with from the off to tell me that I would indeed be one of this year’s contestants along with eight others out of 500 applicants. 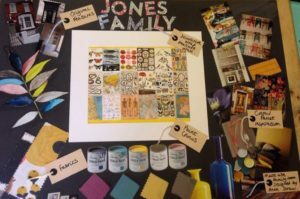 Mock Brief Mood Board – The Jones Family. Another day of filming at mine followed, this time Director Phillipa and Jake the camera man, who would be by my side every minute of the journey. 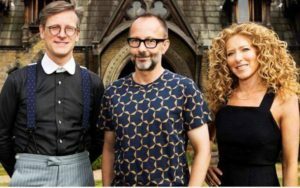 On this occasion I was filmed Q&A style discussing all things interiors, it was at this point Phillipa dropped the bomb that there was a new judge accompanying Daniel Hopwood this series, my favourite Sophie Robinson had left the show and the new judge was world famous interior designer to the stars Kelly Hoppen MBE. Phillipa was keen to capture my response to this news on film as my own style is miles apart from that of minamilist beige loving Hoppen. The shock on my face said it all. 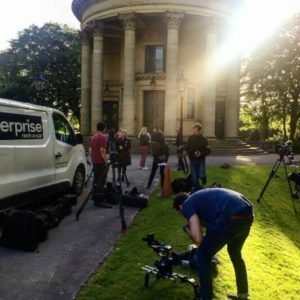 A couple of weeks later I received my clients brief, being a northern girl I was thrilled to learn that I would be filming in historic Soltaire, Yorkshire. 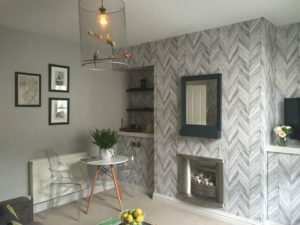 My client (the home owner) was the lovely Joseph, I would be transforming the lounge of his two up two down Grade II listed workers cottage into a multi functional lounging, dining, entertaining space. I spent the next week planning the scheme, budgeting, sourcing items and planning every last detail. Joseph’s brief was to create a contemporary stylish batchelor pad, incorporating a small dining area. Key words were wow, smart, fun, inventive, socialising and unusual. The following Tuesday I packed my little car, using every inch of space to squeeze in all the items I had purchased along with everything else I would need for the few days away from home. During the journey my nerves well and truly set in, how would I get on with my home owner? Would he like my scheme? Does the camera really add 10 lbs? Once there I checked into the hotel for what should have been an early night, however my nerves put pay to that. The next day I arrived on site to some familiar faces along with some new ones too, Francesca my talented decorator and Dicky my amazing builder who had the driest sense of humour. I didn’t get to meet the other two competitors or the judges until later that day. First job of the day was to meet Joseph and present my ideas to him on camera, seven of us in total, including sound, camera and lighting, all squeezed into the tiny space, there was no going back. The scheme I created included a seating, dining and bar area in monochrome, greys, yellows and greens with lots of natural elements and use of different fabrics in homage to the area’s famous Salt’s Mill, who’s owner Victorian Philanthropist Titus Salt built Saltaire Village for his mill workers. I needn’t have worried Joseph was so lovely and really embraced all of the ideas I put to him and the scheme as a whole. Once we’d wrapped up filming the presentation the clock started and that was it, I had 48 hours to complete the scheme! 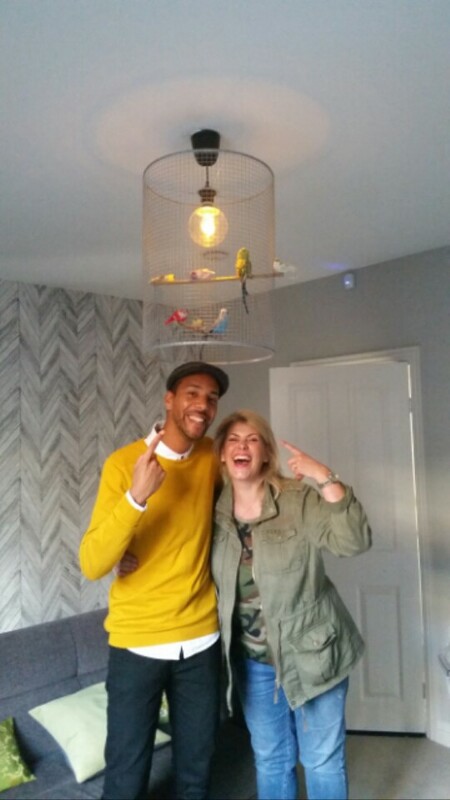 Having briefed Francesca and Dicky we all cracked on, Francesca with the wallpapering, Dicky building the cupboards and me making a birdcage lightfitting, there was a lot to be done. Daniel Hopwood popped in to give me a Judges Challenge, I was presented with 5 vintage bobbins, the sort that would have been used in the mills, I had to find something creative to do with them, a couple were cut down and used as cupboard handles, two more were used to trim the legs of a coffee table I designed and another one used as a decorative piece in a glass dome, as was done with specimens and such like in the Victorian era . It was 3 hours later when the judges popped in to see how I’d used them that I met Kelly for the first time, it was obvious that her and Daniel were to make a great team. Of course there was some drama along the way, the grey paint I was using looked way too blue on the walls so I had to decide on and source an alternative, there was a last minute rush to get the light fitting hung and also lots of late night sewing back at the hotel. Having been the first designer to start on day one I was first to finish on the last day, once I’d finished I got the opportunity to visit one of the other designer’s houses to see their room, after that there was lots of waiting around, the results would not be filmed until 8pm that night. So come 7.30 on a sunny Friday evening designers, judges, crew and by this time presenter Tom Dykof congregate in front of Saltaire United Reformed Church. If you’re reading this you’ll know that I didn’t go through to the next stage. 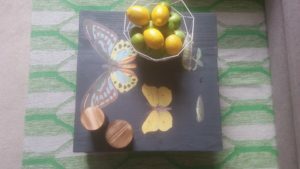 I did however manage to get finished on time and within budget, even managing to add finishing touches such as fruit and flowers. Overall being on the programme was an amazing experience which I would do again in a heart beat, I can’t lie, I was massively disappointed not to have gone through to the next stage, at the end of the day I created an on brief scheme that was delivered impeccably within budget that my client was very happy with, so I feel like a winner none the less. I can’t thank Francesca and Dicky enough for helping bring my ideas to life, Jake for being the most awesome cameraman and giving me a break from filming when I had a mini meltdown and of course Joseph who was kind enough to welcome me into his home and trust me to do my stuff. The only way is up! The fact you met and effectively exceeded the brief totally shows how unfair not getting through was. Loved the design. Kelly is a tough nut to crack, comes across scary even. this article to him. Quite sure he’ll have a good read.